I've yet to meet a Pixar movie that didn't make me cry - and this one is no exception. 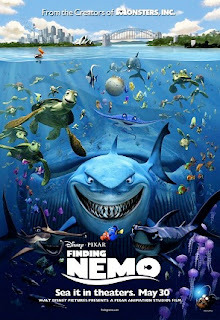 I've seen Finding Nemo many, many times, but it doesn't get old. Although I must admit, I usually skip the opening scene - too much sad for me. This movie has such heart - Marlin really does the impossible to find his little lost son, Nemo. The animation is gorgeous and there are so many characters to fall in love with! Plus - it has those awesome seagulls that make me laugh! Disney/Pixar knocked it out of the park with this film! Make sure you follow along on the Chameleon Girls Facebook page and the Disney 30 Day Challenge Pinterest Board for each day's challenge! Plus, you can read all of my favorites here on the blog! Eh. I wasn't impressed with Finding Nemo. Everyone hyped it up too much before I saw it, I think. I would have chosed Toystory, for sure. How Do You Like Them Potatoes? Monthly Baby Growth Photo Idea - Use a Plush Toy! Content Copyright Director Jewels 2009-2012. Powered by Blogger.